“And there was given me a reed like unto a rod: and the angel stood, saying, Rise, and measure the temple of God, and the altar, and them that worship therein.2 But the court which is without the temple leave out, and measure it not; for it is given unto the Gentiles: and the holy city shall they tread under foot forty and two months” (Revelation 11:1-2). 1st link below was from my video I Published on Apr 25, 2018 showing how the Third Temple could be built where the city of David was. 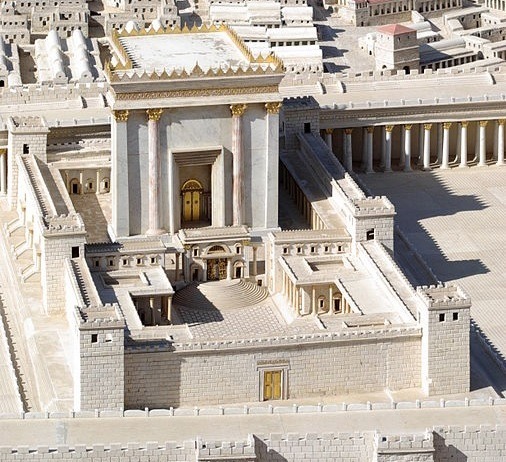 The 2nd link below was another report I Published on Apr 3, 2013, also showing how this Jewish Third Temple may be built in the city of David.Published on Apr 3, 2013. Why am I giving you these links. First of all I wanted you to see what was reported already as it now seems to be the case that the Jewish Third Temple was not located where the Dome of the Rock is now standing and, from the news today it just may happen. Here is a quote from a report today entitled: "Holy of Holies Was Not Where You Think it Was", "If proven accurate, Moskoff’s theory would permit the construction of a structure for Jewish worship without infringing on the Muslim structures currently at the site. Moskoff is working to bring his theory to the attention of Israeli politicians." The title to my post today as I said from that title could be the biggest prophecy news of 2019! It is no small matter that a leading Jewish Rabbi has come up with the finding that the Temple was not near the Dome of the Rock. This news could change a host of issues that have been holding up the PLO and Israeli peace talks. It could mean Israel could let the Palestinians have the Temple Mount as the Jews would be going to the Old City of David to worship there, this would take care of the religious troubles between the Jews and Muslims for a while as well. Keep in mind, the radical Islam base wants to get rid of the Jews and they do not care if the Jews don't pray on the Temple Mount or, in the Old City of David they just want all Jews gone. However, if after Rabbi Moskoff presents his findings to the Israeli leaders and they agree to the point where they give their okay in building the Third Temple we would fall head long into another prophecy. This is that prophecy found in 1 Thessalonians 5:3 “For when they shall say, Peace and safety; then sudden destruction cometh upon them, as travail upon a woman with child; and they shall not escape.” Please keep in mind, I am not saying this is it, that the Third Temple will be built in a matter of weeks. Anything can happen, we have seen things change very fast when it come to the Jews and Muslims especially when they are linked to East Jerusalem. On the other hand we know for sure these prophecies will be fulfilled and that Third Temple Jesus warned us about is coming. Will it be weeks, months, only God knows but it is coming. One thing is for sure anyone who knows Bible prophecy will be watching what happens with Rabbi Moskoff's finding as those finding make there way to the leaders in Israel. If, the Israeli leaders approve these findings and the Jews start building their Temple that would mean the Antichrist will appear on the scene as warned by Christ Jesus. As for me I will be watching this event like a Hawk to see what happens. Since Jesus told us the end time events would happen as a women with birth pains I would expect if the Israeli leaders did give the okay to the Temple things would happen with lighting speed.